Michael Hendry plays a key role in achieving exceptional results on behalf of plaintiffs at Clayton, Frugé, & Ward. Michael’s practice primarily focuses on aggressively representing plaintiffs in automobile, trucking, plant explosion, and catastrophic personal injury cases. Michael is a Louisiana native, growing up in Zachary, Louisiana until his family moved to Baton Rouge at a young age. 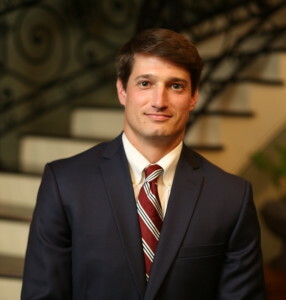 After graduating from Catholic High School in Baton Rouge, Michael attended Louisiana State University, where he received his bachelor’s degree and competed for the LSU Track and Field Team. As a member of the LSU Track and Field Team, Michael received the honor of being named an NCAA Division I All-American for his performance on the track. Michael received his Juris Doctorate from Southern University Law Center in 2014 and was admitted to the Louisiana State Bar that same year. During law school, Michael clerked at Clayton, Frugé, & Ward, and joined the firm as a lawyer after graduation. Michael is an active member of the Louisiana State Bar Association, Baton Rouge Bar Association, Baton Rouge Bar – Young Lawyers Division, 18th Judicial District Court Bar Association, American Bar Association, LSU National L-Club, and the Dow Westside YMCA board. Michael is married and has two sons, Grant and Harrison.